Circa – from the Latin for “around.” Dies – from the Latin for “day.” Rhythmos – from the Greek for “regular recurring motion.” To what bit of body functioning am I referring? This is going to be really good stuff. And I’m introducing the topic in setting the table for a short series that’ll be highly relevant to anyone enduring mood, anxiety, or stress issues. I know you’ll enjoy the material. If something’s “alive” it has a circadian rhythm – an approximately 24-hour cycle (based on the earth’s rotation) of biochemical, physiological, or behavioral processes. Circadian rhythms are actually engineered into our being; yet, environmental factors have major influence. And environmental factor numero uno is daylight. Now, since we’re hard-wired for circadian rhythms, it makes sense that circadian functioning can occur within just one cell. And the activity ramps up from there. See, assorted cells communicate with each other in a synchronized dance of electrical signaling, which manifests in some sort of output. For example’s sake, the secretion of hormones by the endocrine glands would qualify as such output. But if our environment is going to play a role in circadian rhythm, there has to be some sort of receptor that’s pivotal in synchronizing the clocks of our organs. Here goes – the perception of daylight (or lack thereof) is received through the eyes, moves to the brain’s main timepiece (which we’ll review in just a sec); which synchronizes the assorted clocks throughout our bodies. And the most important manifestations of these machinations are sleep/wake, body temperature, hormone production, cell regeneration, brain wave activity, thirst, and appetite. Briefly I’d like to mention something known as photoperiodism – the physiological reactions of organisms to the length of day or night. Well, it’s important to note that our circadian rhythms are responsible for the measurement and interpretation of day length. So just exactly where is our main timepiece? Well, it’s located in a pair of groupings of cells known as the suprachiasmatic nuclei (SCN). And it all happens in the hypothalamus. And to give you an idea of how crucial the work of the SCN are, if we were to somehow have the SCN destroyed, we would say bye-bye to a regular sleep/wake rhythm. And how does it work? 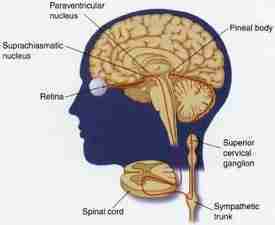 Very simply, the SCN receive light information from the eyes through the retina’s photosensitive ganglion cells. And, by the way, amazingly, were cells from the SCN removed and placed into culture, they would maintain their own rhythm without regard to external cues. So the SCN take the input regarding length of day and night from the retina, interpret it, and send it along to the brain’s pineal gland where the hormone, melatonin, is secreted. And as we might imagine, the secretion of melatonin peaks at night and chills during the day. Hence, its very presence provides information regarding night-length. Melatonin and core body temperature are the two big-time markers for measuring the timing of our circadian rhythm. And recent research suggests melatonin rules the roost. Aside from the big-daddy clock in the hypothalamus, the esophagus, lungs, liver, pancreas, spleen, thymus, and skin have their own clocks, known as peripheral oscillators. Well, listen – we’ve bitten off quite a bit in our first in the series. But at least we now have a firm foundation as we next discuss the relationship between circadian rhythm, mood, and anxiety. Previous Post: Like ice cream…sharing is cool.